The best-selling mid-size pickup for 12 years running drives into 2019 on a hot streak. 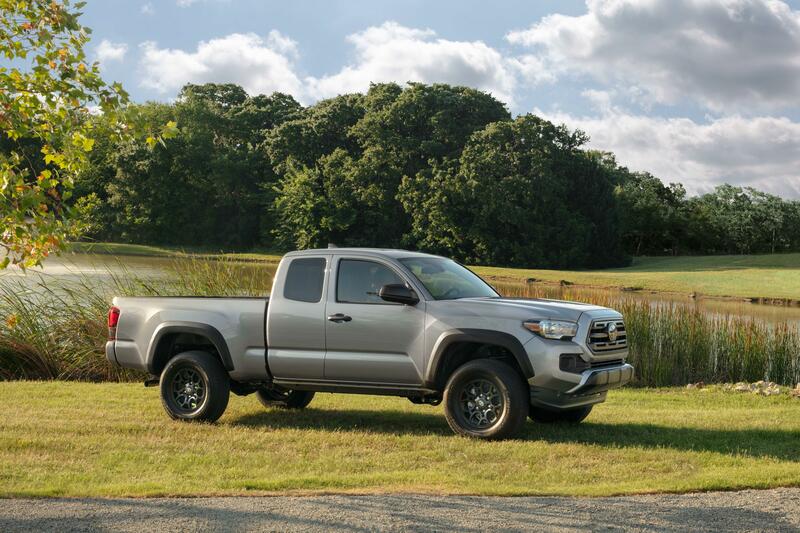 Offering hard-working truck lovers a stylish truck that is light on the wallet, the 2019 Toyota Tacoma is also blowing out the competition thanks to its added capability, reliability, style and even comfort. Built with ultra high-strength steel, all new Tacoma models are built with a stronger foundation than all the rest of the competition. Thanks to its new rugged and intimidating exterior, that has continued to receive some pretty cool updates over the years, the new Toyota Tacoma is also outshining competitors like the 2019 Nissan Frontier. All new Tacoma models are also equipped with a double wishbone coil-spring front suspension and leaf spring rear suspension with staggered outboard-mounted gas shocks that delivers a steady on-road ride and also bolsters this Toyota truck and its off-road driving capability. Like most pickup trucks, the Toyota Tacoma is also built with a powerful 4-cylinder engine that provides 159 HP and 180 lb.-ft of peak torque. Those wanting more power can opt for the Atkinson-cycle 3.5-liter V6 featuring Toyota’s innovative VVT-iW technology. The engine also utilizes Toyota’s D-4S injection system, which incorporates both direct injection and port fuel injection. This efficient engine cranks out 278 HP and 265 lb.-ft. of torque. The 2019 Toyota Tacoma is also more adventurous than most models, including the popular new Ford Ranger. While the return of this past Ford model includes an available FX4 Off-Road Package that features many of Toyota’s popular off-road features like a locking Rear Differential and Hill-start Assist Control, the most rugged Tacoma ever has a half inch greater ground clearance to cover even the snarliest terrain possible. All trims of the new Toyota Tacoma also comes standard with Toyota Safety Sense to keep you and your passengers safe on the road. The ToyotaCare plan also offers a no-cost maintenance plan so you can hit the trails without worry where owners of the 2019 Ford Ranger will have to watch where they go as this truck doesn’t come with a maintenance plan. The addition of the TRD-designed Desert Air Intake, which is designed to help raise the engine’s air intake out of the dust and into clean air, is also something that you are not sure to see on any other truck in the competitive lineup. While most of its competitors are built with the safety of its driver and passengers in mind, the 2019 Toyota Tacoma includes a few added driver assistance aids that are unlike all the others. Along with the Collision Warning System available that even activates at low speeds, the Tacoma also includes lane departure warning, along with Driver and front passenger seat-mounted side airbags, driver and front passenger knee airbags, and front and rear Roll-sensing Side Curtain Airbags (RSCA). Now that you have been told why Toyota continues to top the charts in the mid-size pickup truck department it is time to get to Pedersen Toyota to get behind the wheel of a new Tacoma in our inventory today.